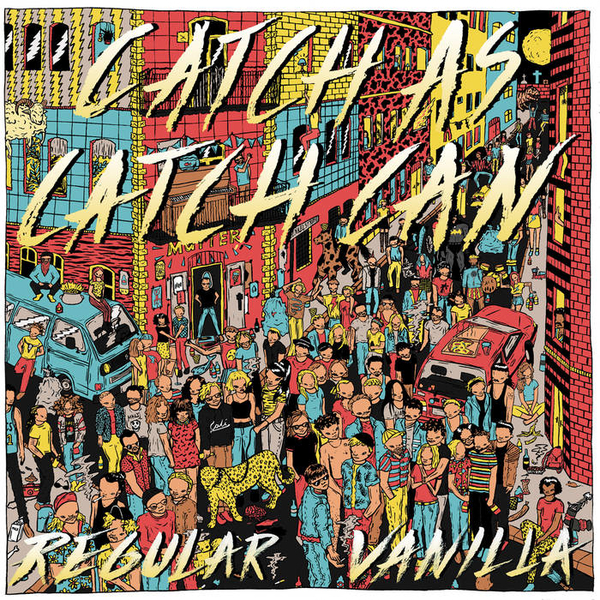 CATCH AS CATCH CAN is the new deal from german siberia, one stomping feet, four hands and red rolling eyes! It's all about dancing frantically! CACC got us, kids, we dig bands where drummers shout their soul out and the audience is getting closer and closer. This animal has a diverse, revved up, no reins, 60's gumball punk show, takin' tricks from ramshackle Krautheim, Atlanta, Harlem, Coal Mines and Burger City and of their hometowns' own King Khan And The Shrines folk. 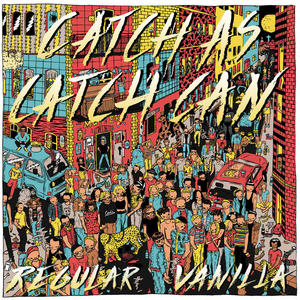 Regular Vanilla is stacking hook on top of the hook, surrounded by a loose 70´s schmuddelfilm organ, wry doo-wop, flavored with all the psychotropics of the sackerl. They rushed thru the recordings like stags and you can hear their nonpolarised jukebox rock'n'roll, pure joy is dropping on all sides of the platter. This is a giraffe ride from the empty swiming pool stand-up singing, straighthru a covered with curtaind of scissors new wave ballroom to a high noon khanish psych garage snake pit ritual. Jungle backups by the master himself, lovely guest singing by his daughter Saba Lou . Produced by KING BAMA LAMA KHAN. Recorded by NENE at Porc. Mastered by A-Hule-Hule w./ Analog Life Of Satisfaction Expectancy Ratio! Music journalists, here is your migraine!